The London stained glass firm of Clayton & Bell was founded in 1855 and continued until as recently as 1993. The founders were John Richard Clayton (1827-1913), and Alfred Bell (1832-95), who entered into a partnership with Clayton in 1856, having previously worked in the studio of George Gilbert Scott. By 1859 these were definitely "the rising stars of Victorian stained glass" (Cheshire 24), and the firm was soon preeminent among the stained glass designers and manufacturers of the time — a time when this glass was in huge demand. As a large-scale producer, catering to the market for decorative schemes in churches and grand secular buildings alike, the firm has been criticised for over-production: in the mid 1860s, it had 300 employees in its Regent Street workshop ("Clayton and Bell [1855-1993]"). Scott, who had thought very highly of the precocious Bell, was particularly outspoken in his criticisms, feeling that artistic talent had been betrayed here: "No real art can stand against a constant high-pressure and working against time. Some of Clayton and Bell's productions are of a high character, but a large proportion are damaged or ruined by one or both of the influences above-mentioned. Their works are by no means whatever proportioned to their ability." Scott was biased: he particularly disliked the craze for "antiquated drawing," with its "oddness" or even "grotesqueness" (222); "wretched, mawkish attempts at picture-painting" also annoyed him, and altogether he found it positively "vexatious" that Clayton and Bell, "from whom better things might have been hoped, and who have produced fine work" should follow such trends (223). 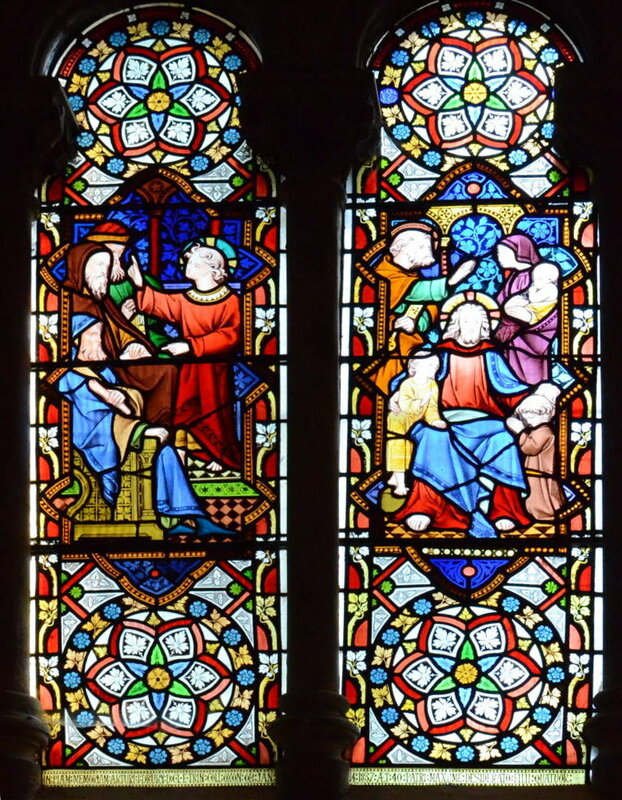 However, the firm retained its position, and from what can be seen even in local parish churches which commissioned work from them later on, there was a return to form in the last decades of the century, as it passed into the hands of the next generation. — Jacqueline Banerjee. "Clayton and Bell (1855-1993." Stained Glass in Wales. Web. 9 July 2014. Scott, G. Gilbert, ed. Personal and Professional Recollections of the Life of Sir George Gilbert Scott, R.A.. London: Sampson Low, Marston, Searle & and Rivington, 1879. Internet Archive. Uploaded by the University of Michigan. Web. 9 July 2014.